In 1099, the soldiers of the First Crusade took Jerusalem. As the news of this victory spread throughout Medieval Europe, it felt nothing less than miraculous and dream-like, to such an extent that many believed history itself had been fundamentally altered by the event and that the Rapture was at hand. As a result of military conquest, Christians could see themselves as agents of rather than mere actors in their own salvation. The capture of Jerusalem changed everything. A loosely defined geographic backwater, comprised of petty kingdoms and shifting alliances, Medieval Europe began now to imagine itself as the center of the world. The West had overtaken the East not just on the world's stage but in God's plans. To justify this, its writers and thinkers turned to ancient prophecies, and specifically to one of the most enigmatic passages in the Bible the dream King Nebuchadnezzar has in the Book of Daniel, of a statue with a golden head and feet of clay. Conventional interpretation of the dream transformed the state into a series of kingdoms, each less glorious than the last, leading inexorably to the end of all earthly realms-- in short, to the Apocalypse. The First Crusade signified to Christians that the dream of Nebuchadnezzar would be fulfilled on their terms. Such heady reconceptions continued until the disaster of the Second Crusade and with it, the collapse of any dreams of unification or salvation-any notion that conquering the Holy Land and defeating the Infidel could absolve sin. 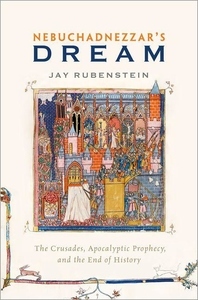 In Nebuchadnezzar's Dream, Jay Rubenstein boldly maps out the steps by which these social, political, economic, and intellectual shifts occurred throughout the 12th century, drawing on those who guided and explained them. The Crusades raised the possibility of imagining the Apocalypse as more than prophecy but actual event. Rubenstein examines how those who confronted the conflict between prophecy and reality transformed the meaning and memory of the Crusades as well as their place in history.